Gabriel Chanan argues that for communities to become empowered, public services must become more participatory. By Gabriel Chanan, Director, Health Empowerment Leverage Project. The Empowered Communities in the 2020s research is vital given the current disconnect between public services and communities. I’m sure that many people would agree with the emerging themes from the opening survey - power to make local decisions, participation in policy, resources to work with communities, support and confidence. However, I think there needs to be further investigation in to how public services can be strengthened and reformed to be responsive to communities. Communities can’t become empowered while public services continue to decline. Public services not only need to be revived, they need to be genuinely participative. It should not have been possible or permissible for the repeated warnings from the Grenfell Tower tenants to be ignored. What gave Big Society the appearance of novelty and radical change, which Matt Leach discussed in his blog, was the removal of community participation from public services, and the resources that went with that. 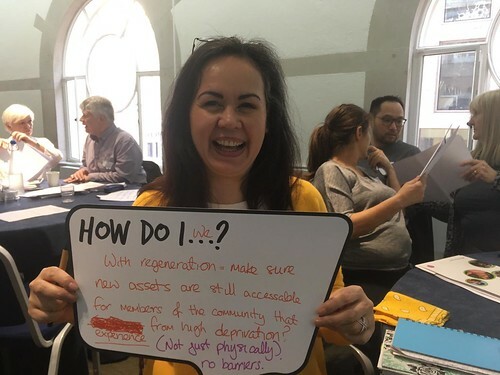 We should look at participatory methods that came just before the Big Society policy, which were much more positive – methods based on the experience that public services and communities either thrive together or decline together. If seen as alternatives, communities soon find themselves overwhelmed with impossible demands. In a climate of oversimplified notions of globalisation, the decline in public services may be seen – even welcomed by some – as irresistible. Some of the research respondents seem to yield to this sense of inevitability. But this can become self-confirming defeatism. Society is still hugely and necessarily dependent on public services, paid for by taxes (irrespective of whether they are delivered by public, private or voluntary sector organisations). The chart below shows that over recent years state expenditure on health has grown substantially yet still can’t keep up with rising demand, whilst spend on ‘others’, which includes local authorities, care, benefits – and indeed community development - has declined. The decline in spend on ‘others’ is the source of much of the extra pressure that has been placed on the health service. We are told that a huge proportion of the population is prone to depression, and this is a health issue. It is – but isn’t it first and foremost a community issue? Wise heads in the health field have been saying for decades that health strategy needs to ‘turn to the community’. But the system is still struggling with how to do it, whilst the parts of the public services that were most skilled in community involvement have fallen to the sword of austerity. Communities do need to be strong and independent in their own right, not least in order to be real partners in decision-making, rather than just clients. But their ability to do this depends firstly on adequate provision for services and secondly on the revival and further development of the experiments in partnership between services and communities which were arbitrarily cut off in 2008-10. To achieve empowered communities, we need to work for new forms of partnership between strengthened communities and strengthened public services.